Over 200 million people were killed in the Twentieth Century as a result of acts of violence generated by nation-states and other societal groups. Historians document what occurred, but do we really understand why these things happened. This book—based on forty years of research—contains my findings on the sources and meanings of collective forms of violence. Scholars study political conflicts as if each one were a discrete case, seeking to identify “causes.” But is it possible that there is a fundamental dynamic that leads nations to go to war: an underlying principle that is independent of specific political situations? I began my research studying Hitler, Nazism and the genocide of the Jews. The Final Solution or Holocaust is a particularly fruitful case study because there was no apparent reason why the Jews had to be killed. Political scientists who rely on “rational choice” theory to explain political events find little in this approach to help them understand the Holocaust. In 1933, there were only 550,000 Jews in Germany out of a population of 66 million, far less than 1% of the country’s population. Jews constituted no threat to Germany. Yet Nazi leaders such as Hitler, Goebbels and Himmler imagined that Jews were acting to destroy their nation—and Western civilization. Why did Hitler and the Nazis believe that this was the case? This book poses and seeks to answer this question. Nazism sometimes is conceived as an ideology of the “superman.” What I found, however, is that Nazi ideology revolved around the idea of sacrifice. According to Hitler, the greatest form of virtue was the willingness of individuals to give their lives over to the community. Jews on the other hand were conceived or imagined by Hitler as people unwilling to sacrifice their lives for a national community. As I attempted to uncover the roots of the Holocaust, it became evident that the formative experience of Hitler’s life was his participation in the First World War. My research moved toward examining this other instance of societal mass slaughter. This book reports the results of my odyssey, focusing on my discovery of a similar psychological dynamic at the root of both the First World War and the Holocaust. Like Nazism, ideologies that gave rise to the First World War revolved around the idea of sacrifice, which is intimately linked to the ideology of nationalism. During the First World War, millions of young men were sent into battle, killed and wounded in the name of entities given names like France, Great Britain, Russia and Germany. The ideology of national self-sacrifice led to monumentally destructive results. Approximately 6,000 men died per day in the course of the war—that began in 1914 and ended in 1918. In spite of perpetual slaughter, the war persisted. The scope of destruction brought about by the First World War—9 million dead and nearly 21 wounded—seems incomprehensible. This book seeks to decipher the meaning of the massive destruction that occurred during the First World War—and to link what happened in this war with what occurred during the Holocaust and Second World War. I attempt to demonstrate that in each case, political violence was generated according to the dynamic of sacrifice. Is it possible that human beings can be possessed by this sort of “madness”—a willingness to sacrifice millions of human beings in the name of abstract entities called nations? I present evidence showing that this was the case. The magnitude of political violence and destruction that occurred during the Twentieth Century is difficult to fathom. We are capable of knowing what occurred—the facts are part of the historical record and beyond doubt—but we tend to conceive of events as if they emanate from a domain of reality separate from human motivation. It is difficult to conceive that we human beings are the source of what occurred; that we willed these events into being. Adolf Hitler is the central focus of my study. This single individual played a profound role in the history of the Twentieth Century. Some people claim that Hitler was an anomaly. What I document in this book, however, is that Hitler’s thinking was firmly rooted in the central ideologies of the Twentieth Century. Hitler embraced the very ordinary ideologies of nationalism, racism and warfare—and carried them to an extreme, bizarre conclusion. Hitler did approach performing a critique of warfare when he posed the question (in Mein Kampf, 1962): “Why do some men die in battle—sacrifice their lives—whereas other men do not?” This question quickly transformed itself, however, into a condemnation of Jews: Why, Hitler asked, had German men died in the First World War, whereas Jewish (German) men had not? Although there was no evidence to support Hitler’s claim, nevertheless he believed that Jews had been “shirkers” during the First World War: had avoided participating in battle. Hitler became obsessed with the idea that Jews had acted to escape the sacrificial obligation. This belief became the basis for his anti-Semitism. Hitler conceived or imagined Jews as people who were unwilling to sacrifice themselves for a national community. As soon as Hitler took power in 1933 and became Chancellor of Germany, he began fantasizing about a Second World War. He did not shrink from the idea of repeating the sacrifice of German soldiers that had occurred during the First World War. When he declared war on September 1, 1939, he asked every German to be prepared to do what he was willing to do (and eventually did): to lay down their lives for their country. But if Germans were going to die in the Second World War, what about Jews? If Hitler had the “right” to require that his soldiers be obedient unto death, why should Jews be allowed to live? These reflections led Hitler to an “insight” that provided the rationale for the Final Solution. As the Holocaust began, Hitler professed to be undisturbed by the murder of men, women and children. “If I don’t mind sending the pick of the German people into the hell of war without regret for the spilling of precious German blood,” Hitler declared, “then I have naturally the right to destroy millions of men of inferior races who increase like vermin” (Meltzer, 1976). If Hitler had the right to ask his own soldiers—the best people—to die, why did he not also have the right to send Jews—the worst people and mortal enemies of the German people—to their deaths? As German soldiers were being slaughtered, so Jews would be slaughtered. The Final Solution represented an enactment—created by Hitler and the Nazis—conveying the abject condition of a human being that has been required to give his body over to the nation-state. German soldiers had been conceived as masculine warriors or heroes. But on the Eastern Front in the Soviet Union they were like Jews in the death camps—pathetic and abject—freezing, starving and dying in prodigious numbers in places like Stalingrad. Although historians write about the desire for conquest, economic gain and many other factors that motivate societies to go to war, one product of warfare remains constant: death, maiming, and the destruction of the artifacts of civilization. We view death, maiming and the destruction of the artifacts of civilization, however, as by-products: things that occur as nations and leaders pursue other objectives. But what if destruction and self-destruction are the fundamental purpose of warfare? This is the conclusion that I have reached. More precisely, perhaps warfare is undertaken as a form of sacrifice—a gigantic potlatch—whereby human beings give over their bodies and possessions to objects of worship with names like France, Germany, Japan, America, etc. We would prefer not to know that this is the case. We still exist within the heart of the storm. Nationalism is a living religion, so powerful that we barely conceive of it as a religion. Yet Carolyn Marvin in her ground-breaking Blood Sacrifice and the Nation (1999) develops a theory similar to the one I present in this book. She shows how warfare and sacrifice function to support and sustain the idea of the nation. I explore this idea in Chapter III of this book, “As the Soldier Dies, So the Nation Comes Alive,” as well as in Chapter V, in which I examine parallels between the First World War and the Aztec performance of warfare as a ritual sacrifice. Are we in the Western World similar to the Aztecs in that we sacrifice human beings in the name of our Gods? Sadly, it would appear that this is the case. The difference is that the Aztecs were aware that warfare was a sacrificial ritual, whereas we in the West are not yet aware of this. One objective of this book is to help us to become conscious of the central role of sacrifice in our political rituals. Marvin writes about blood sacrifice in war as the “totem secret.” The fact that nations create warfare as a sacrificial ritual is something that we are not supposed to know. Indeed, we don’t wish to know that this is the case. What would it mean if people were to become aware that warfare is an institution whose purpose is to sacrifice—or kill—people? Hitler nearly understood this. He realized that nations have the right to kill. 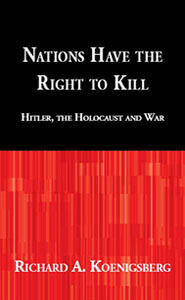 The purpose of this book is to provide documentation showing how nations act in the name of killing or sacrificing people. We understand that nations have the right to kill, but assume there are specific reasons why states find it necessary to go to war. But what if it turns out that the production of sacrificial violence and victims is an essential function of the nation-state? What if wars are waged not for specific reasons, rather in order to produce opportunities for killing and dying? What if it turns out that killing (producing sacrificial victims) is one of the fundamental purposes of collective acts of violence? If we become capable of knowing this, will it make a difference?